Fashion Architect: OZON Fashion Live! The OZON Raw team presents a new type of event, giving young people interested in pursuing careers in fashion and photography a great chance to showcase their talent, participating in all stages of production for three fashion editorials. 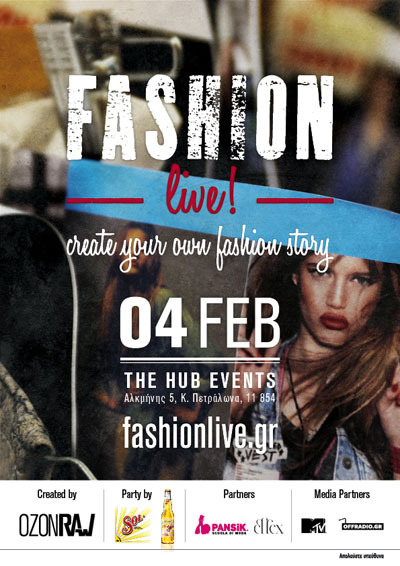 FASHION LIVE is an all-day workshop that will take place on Saturday, February 4th, at Hub Events. The participants will be working in teams according to their field of interest (production, hair & make-up, styling, art direction, photography) and will be able to select clothes from brands such as Wrangler, Lee, Vans and Adidas Originals. Registering for the workshops is now closed, but all the editorials produced by the participants will be presented at the fashion live party that will take place at 21:00.